Looks like development of the next iteration of Research In Motion’s PlayBook operating system is going well enough that the company actually has something it can comfortably show off to the media. And it’s going to show it off next week at the 2012 Consumer Electronics Show. Late Thursday, RIM distributed invitations to “an intimate event” to be held at CES on January 10. 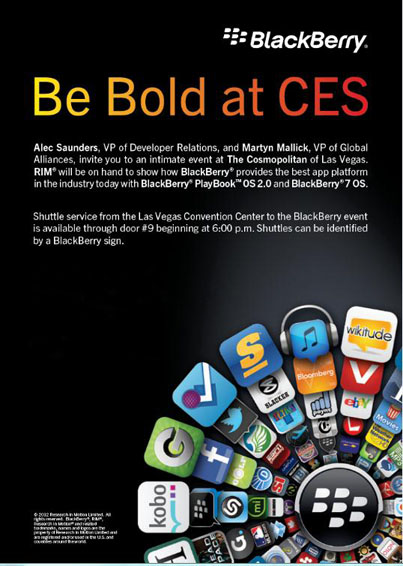 Emceed by Alec Saunders, RIM’s VP of developer relations, and Martyn Mallick, VP of global alliances, the event touts the BlackBerry as “the best app platform in the industry today,” and promises to prove it with a demonstration of PlayBook OS 2.0 and BlackBerry 7 OS. Evidently, RIM has made some remarkable improvements to both operating systems, as well as its straggling app ecosystem. If it hasn’t, it’s never going to hear the end of that “best app platform” claim. That said, the long-awaited addition of the native email, calendar and contact apps that the device debuted without should go a long way to silencing at least a few of the complaints that have plagued it. RIM is expected to release PlayBook OS 2.0 to consumers sometime in February, the same month it reportedly plans to debut BlackBerry OS 10 at Mobile World Congress.